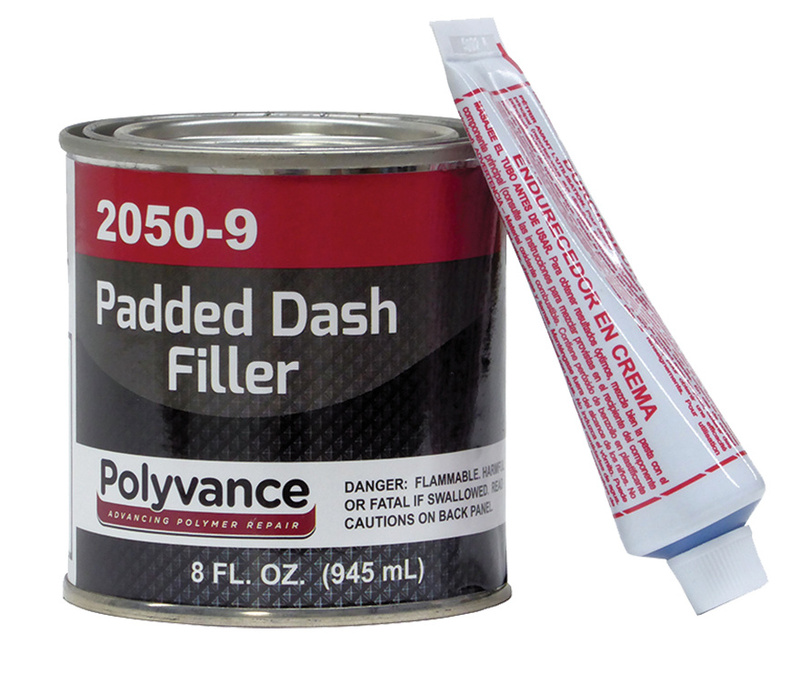 Our Padded Dash Filler is formulated from special polyester resins that increase adhesion to vinyl and other plastic substrates. 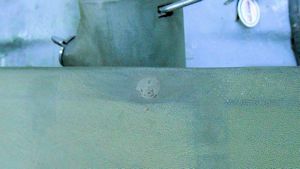 Flexible resins are used to give the flexibility required to withstand the expansion and contraction brought about by extreme temperatures. It has excellent filling qualities with shaping, sanding and feather edging accomplished with ease. This makes an excellent filler for padded dash repair since the sanding is normally done by hand. Each can contains 8 fl. oz. (236 ml) of padded dash filler and comes with a 2 fl. oz. (59 ml) tube of cream hardener. As you can see, this dashboard has a hole that needs to be repaired. 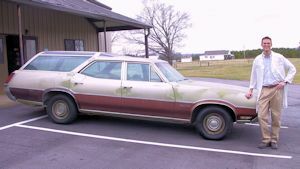 Most old cars and some new cars have dashboards made from vinyl over urethane foam. Over time in the sun, the vinyl gets brittle and the dash board gets cracks. Many newer dashboard don't have any foam at all. Instead, they are made from injection molded TPO or ABS. But, these dashboards can also get cracked or get holes from exposure to the sun. 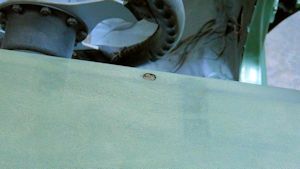 Use 80 grit or 180 grit sandpaper to bevel into the damage. Make sure that you sand out any dried-out and crusty foam, too. 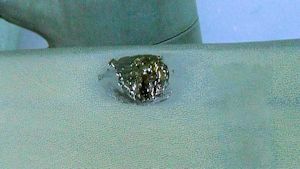 Melt some of the polyurethane welding rod into the void that was created when you sanded out the crusty, dried out foam. 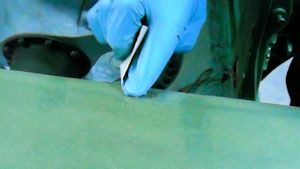 The urethane rod is very flexible and closely simulates the urethane foam. 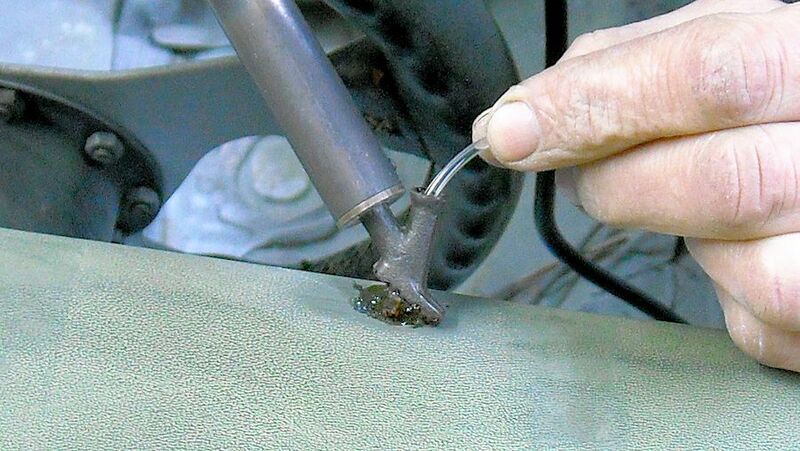 Turn the temperature all of the way up and the melted rod come out bubbly. Some of the bubbles remain encapsulated within the polyurethane and simulates the foam even more. Overfill the hole slighly. 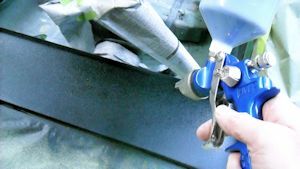 You will be sanding it down and it is better to overfill slightly than having to find out that you need to melt more polyurethane rod into the hole after you have sanded it. IMPORTANT NOTE:If you have one of the newer dashboards that don't have any foam, you may skip this step. This is what it looks like after filling the hole. Use 80 grit sandpaper to sand the urethane level with the surrounding area. 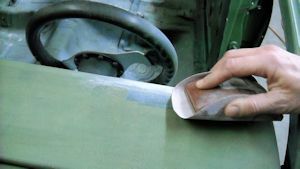 The urethane is very stretchy and elastic so, if you use really short strokes when you sand, it may just stretch back and forth rather than getting ground away. 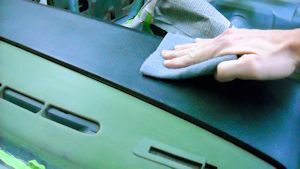 A good way to prevent the back-and-forth stretching is to put your thumb on top of the sandpaper over the area that you need to sand. Then, pull the sandpaper while maintaining downward pressure with your thumb over the urethane. 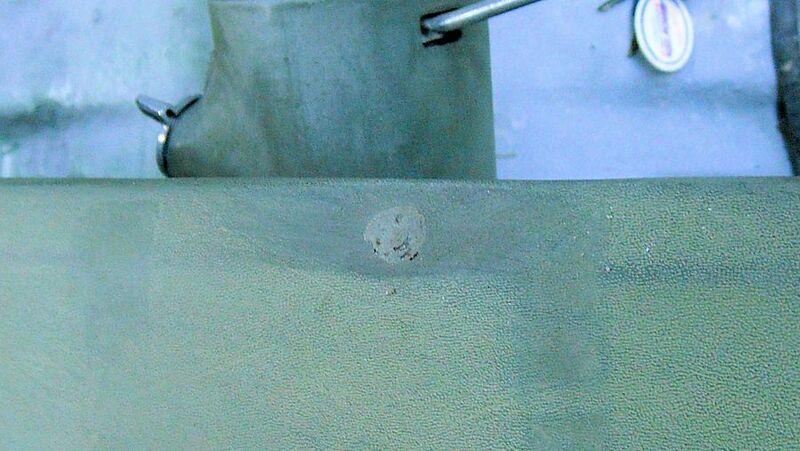 This is what the damaged area looks like after the urethane welding rod was sanded down. Mix some Padded Dash Filler with the cream hardener according to the instructions. Use a spreader to apply the Padded Dash Filler to the damaged area. 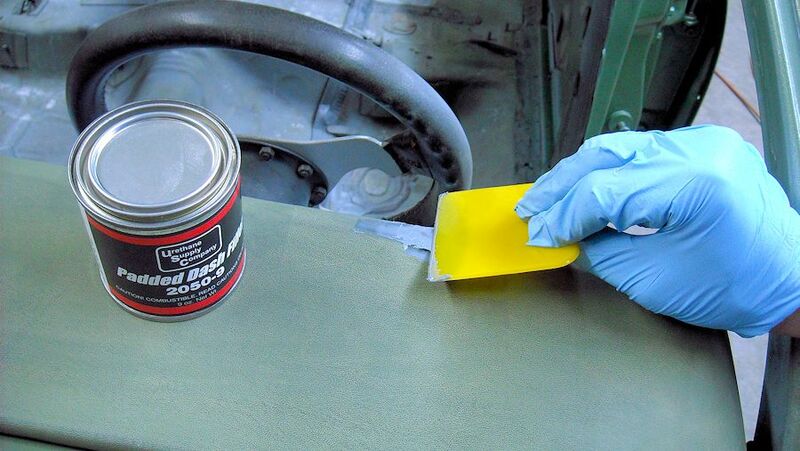 Allow time for the Padded Dash Filler to cure. Sand it smooth starting with 180 grit sandpaper and then 320 grit sand paper. 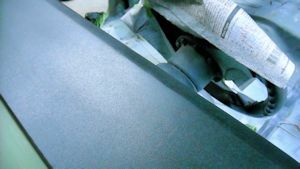 This is how it looks after sanding smooth the Padded Dash Filler. 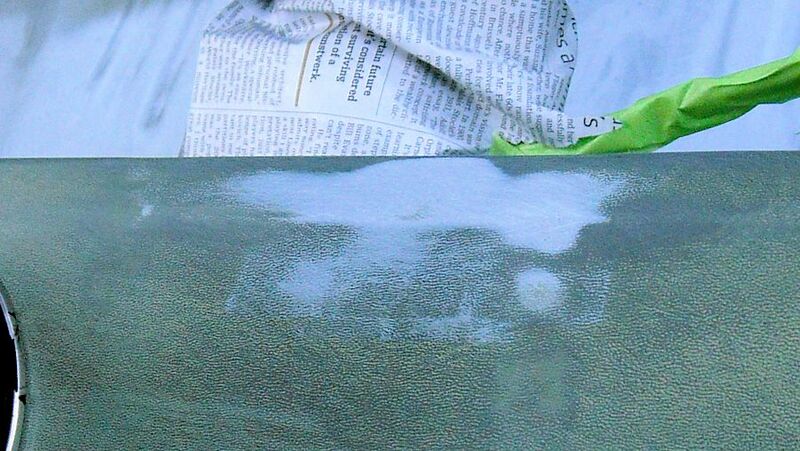 Spray on Flextex VT. You may want to spray the texture coating on something else first. You will get different size texture depending on your spray gun settings and how much you reduce (dilute) the Flextex with lacquer thinner. 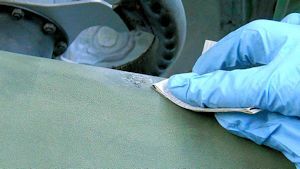 Lightly scuff the texture coating with a scuff pad to remove any high spots. 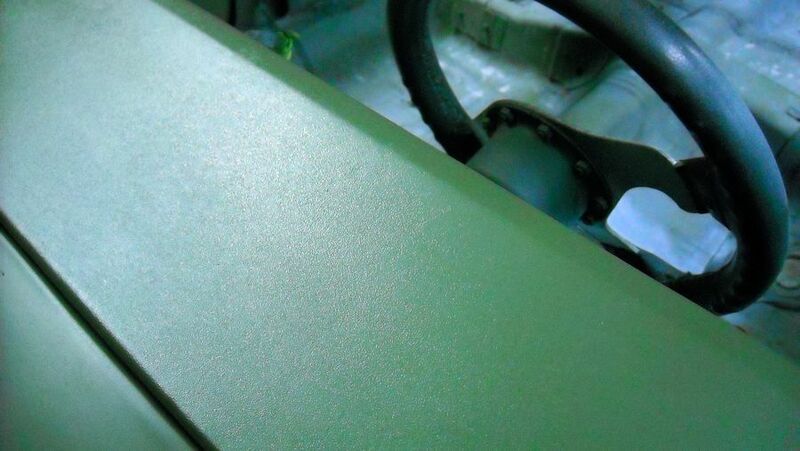 Sometimes the texture coating can be a little bit rough after it is applied. This is how the dash pad looks before the top coat is applied. 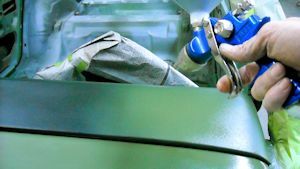 A topcoat was applied to match the original color. Here is the finished dash repair and restoration. As you can see, the dashboard looks great. Now, for the rest of the car.